Just getting started. 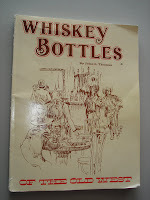 Looking for collectors of early western bottles, particularly applied top whiskey bottle collectors, to share information about their bottles. Pictures, history, digging stories, bottle shows, anything that is related to the old fifths and flasks. I hope to post information that collectors will find interesting, and hope to attract some new collectors that may have an interest in this specialized field of bottle collecting. Send me a comment or a picture and lets see where this takes us. 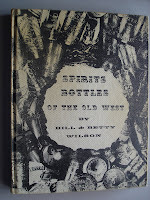 I have been an avid collector of these old western bottles for nearly 40 years. I have seen many collectors and collections come and go over the years. The applied top or glob top western whiskies have always been near the top of the list of western collectible bottles since the beginning of the bottle craze in the late 1950's. Ghost town digging in California, Nevada, and Utah produced some of the first examples of these wonderful old bottles. Bottle collectors formed bottle clubs and every major city in the West had a club and a 'bottle show and sale' each year. Examples of these glob top whiskey bottles changed hands at these 'shows' and before long a group of collectors began to look for or specialize in this particular type of bottle. Collectors traveled to the Las Vegas show, Santa Rosa show, and other shows just to look for glob tops. Urban renewal projects in Sacramento, San Francisco, Stockton, Portland and other early western cities uncovered pre-1890 refuse dumps. New examples of glob fifths and flasks were discovered, bottles were found in different colors. Collectors began to look closely at their collections and found that the same embossed bottle might have subtle differences in the mold or lettering, indicating several variations may exist for particular bottles. 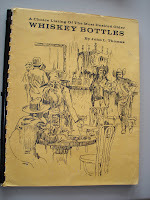 Finally in 1968, there was enough information, enough collectors, and enough demand, that two books were written on the subject of WESTERN WHISKEY BOTTLES. The bottles I am referring to here are mold blown bottles that have the raised lettering on the bottle, usually the on the face of the bottle or shoulder. Although these "embossed" bottles or private mold bottles became popular in the 1830's and 1840's, and embossed bottles were blown on the West Coast as early as 1859, the cylinder western fifth was probably first embossed in 1868. Embossing a company name on the container, as well as the name or trademark of the famous brand of bourbon or rye in the container became very popular in the 1870's. Dozens of different companies or their agents came out with embossed whiskey bottles and a field of bottle collecting was created. Glob top bottles or applied top bottles refer to style of manufacture of the top of the container. The term applied top, as you may guess, refers to the top being applied to the neck in a separate step at the glass works. The earliest embossed western fifths 1868-1880, are usually found with this crudely "applied top". The top may sit crookedly on the neck, the "mold seam" runs up the side of the neck and under the top. The favorite feature with collectors is when there is actually a "drip of glass" or glob of glass hanging down the neck from under the top. Hence the name GLOB TOP or GLOP TOP. In using the term WESTERN GLOB TOP WHISKIES it is not meant to cause any geographical arguments. 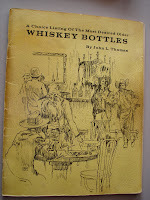 The whiskey bottles I am talking about were blown and distributed almost exclusively for the western market. Most of the embossed bottles carried the brand names already made famous in the eastern United States. CUTTER, BLAKES, W.A. GAINES, MCKENNA, S.T. SUITS, so on. The western agents for these brands were the driving force behind the "embossed" fifth containers. S.T. SUITS KENTUCKY BOURBON is a good example. WALKER BROS. were liquor dealers in Salt Lake City in the 1870's. They became SOLE AGENTS for S.T. SUITS KENTUCKY BOURBON for the Utah Territory in 1872. The bourbon was shipped from the east to Walker Bros. in Salt Lake by the barrel. Embossed bottles were ordered from one of the west coast glass works, probably the SAN FRANCISCO GLASS WORKS, and also sent to Salt Lake to be filled and sold by the fifth. The S.T. SUITS glob top fifth is recognized as one of the TOP WESTERN WHISKEYS, but the Suits name is well known to eastern collectors. In the east the containers of choice are various sizes of "salt glaze" jugs. I will post more information about the different bottles that are found with the same names both in the East and the West. Exceptions to every rule it seems, but it is safe to say that the embossed cylinder whiskey bottle became synonymous with the West. Whether it was a form of advertising, or a guarantee of the genuine item and quality, the embossed cylinder whiskey bottle was very widely used in the West from 1868 through prohibition. 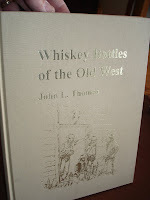 It is not a surprising fact that almost all of the EMBOSSED GLOB TOP WHISKEY FIFTHS 1868-1880 are found in the west. Cal., Nev., Utah, Oregon, Washington have produced the most. Some have been found in Idaho, Arizona, Alaska, a few in Hawaii, and a very few in Colorado. Montana may have yielded a few and possibly Wyoming though I don't know of any intact examples positively found in either of these states. The area west of the Rocky Mtns. is really the only area these bottles are found or more precisely "pulled out of the ground".